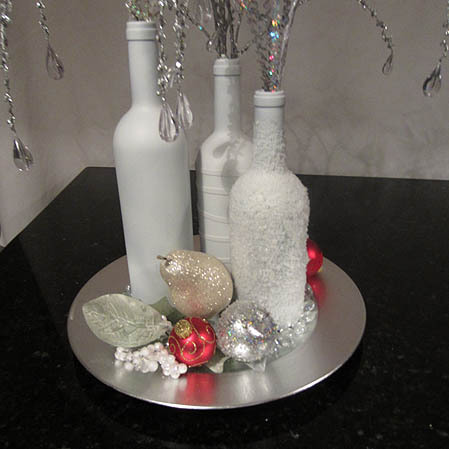 Here’s a great way to repurpose empty wine bottles for yourself or for gifting. 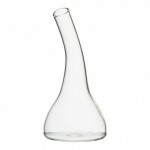 Using a bottle cutter, cut the bottle base on two bottles. You’ll want the bottles to have varying heights so keep that in mind when making your cuts. Spray the bottles with white primer spray paint. I picked mine up at Home Depot. You’ll also need spray adhesive, Epsom salt, and rubber bands. I didn’t purchase any at the time, but it is a good idea to spray the finished bottles with a clear sealant to help seal the paint and the salts. I’ve posted a page here that explains how to make this arrangement along with additional pictures. If you keep the bottles white, you can change the arrangement for most any season. This was my daughter’s lunch yesterday. 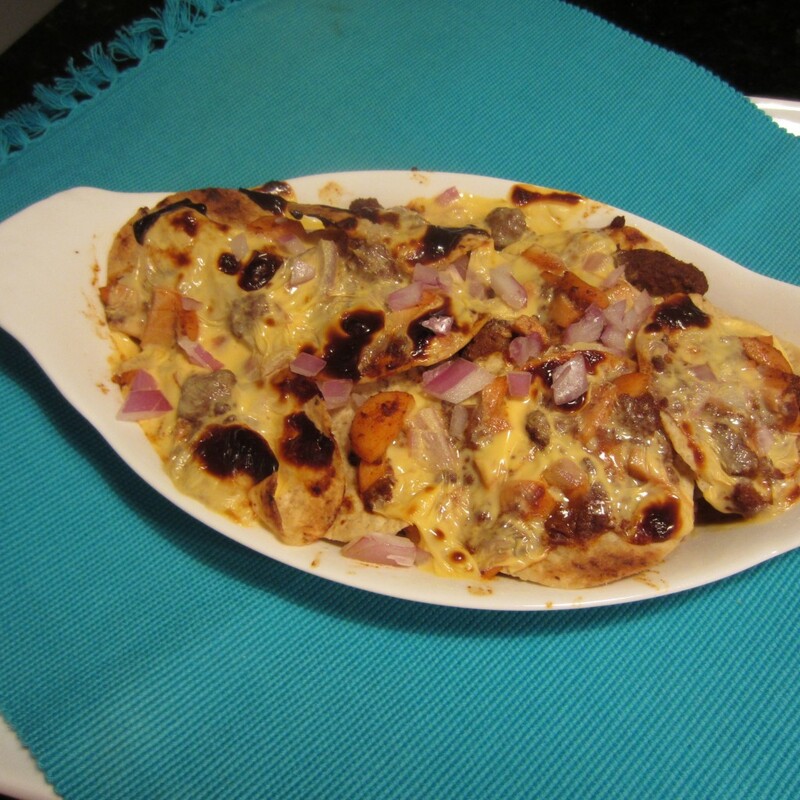 These chili cheezy nachos are super easy to make and score high on the delish scale. I’m not a big fan of beans in my chili so I opted to use low fat turkey chili minus the beans. It’s just a personal choice, but bean chili can also be used. Low fat cheddar cheese slices were torn and melted on top. 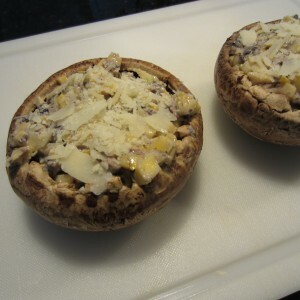 It takes less than 7-8 minutes to prepare the dish and only 48 seconds in the microwave to heat and melt the cheese. You can also place under a broiler for a couple of minute until cheese is melted. 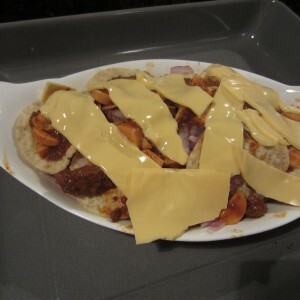 Place slices of cheddar cheese on top. This is perfect dish to serve up while watching the guys (and gals) are watching a sporting event on TV. Add side servings of salsa and sour cream . The nachos are slightly higher in calories than other Blimpy Girl dishes but sometimes you just have to live dangerously and go for the gusto. You’re in the neighborhood of 420 calories for a plate of 26 nachos. You can easily cut the serving size in half and save yourself 210 calories. I’m going to share a little known secret about Blimpy Girl. All those lovely plated meals and pictures I show online… they are all pretend. Just kidding! But in some regards, it’s not all that it appears to be. In the real world of Blimpy Girl, I barely have time to eat the meals I prepare. This picture presents a good image of how I eat on the fly. I’m having lunch in my office today while texting, answering phone calls, responding to emails, and all the other computer stuff that goes with running a company. 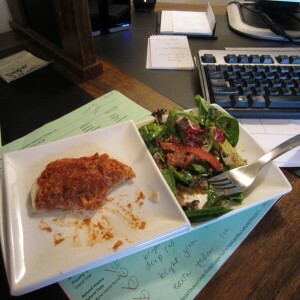 There are those few occasions I actually get to sit down at a table and eat my meals. For the most part, that is not the case. Just like you, my life is full, busy and there’s little time for even the essentials…like eating. There are many days I spend at least 10 minutes just looking for my eyeglasses which tend to be parked on my head. Go figure. My point? Blimpy Girl is no different than you. Yes, I’ve lost weight, but it’s a daily struggle to maintain that weight loss. Heck, just this week I purchased a bag of Funyuns to use as a breading for a chicken dish. Within 10 minutes, I had opened the bag and chowed down 500 calories of delicious goodness. I should also mention it was 500 whopping FAT calories. Just wanted to let you know that Blimpy Girl is a real person who battles the same food and calorie demons as you. My goal continues to be 3- 5 small meals a day and keeping my calorie intake at 1200. Your goal may differ, but the bottom line is being consistent in managing your weight loss. You can’t binge and starve (that’s what my honey man does) and expect to maintain a weight loss agenda. Have an eating plan in place and follow it. If you run off course every now and then, that’s OK. Just get back on the fairway and look for the green. If you’ve never golfed that will make no sense to you. So… how about this? If you get off onto the shoulder of the road with your diet or eating plan, turn your wheels and drive like a bat outta hell until you’re back on track. Leave skid marks if you have to but get back on the road to a healthy eating plan. You can do it! OK. I’ll be the first to admit that I dislike eating leftovers. If I had it the night before, I don’t want it for dinner the next night. In this case, I made an exception. That delish BBQ chicken dish I made the night before turned into a BBQ chicken sandwich for lunch today. I shredded the chicken with fork prongs. The chicken was so tender from cooking in the crock pot that it shred easily. 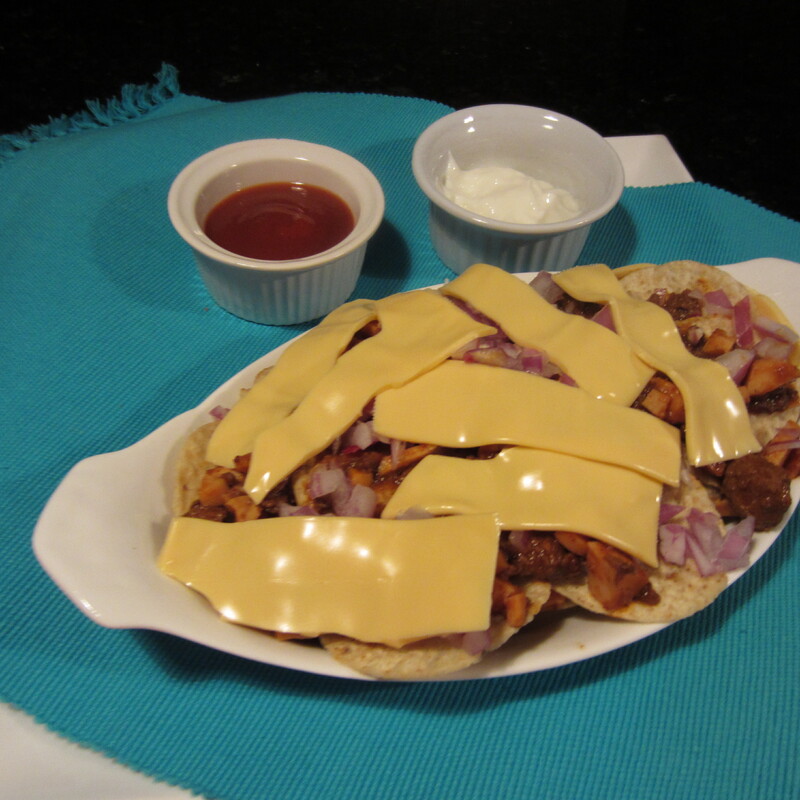 The leftover BBQ sauce mixture was tossed into the shredded chicken and stacked onto a “sandwish” bun. These buns are only 100 calories and an awesome addition to the pantry for those counting calories. 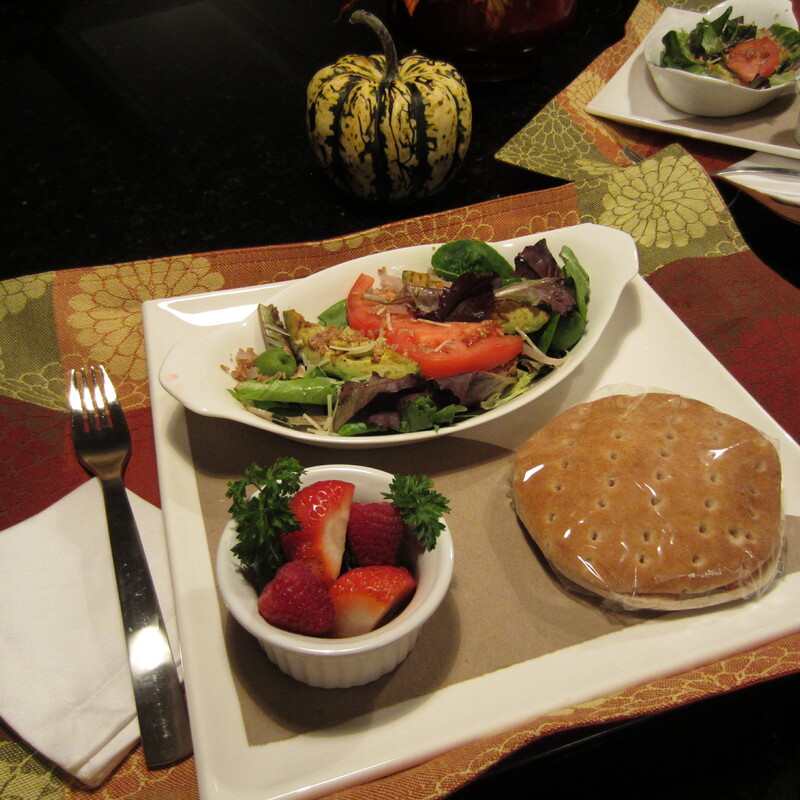 My daughter will be picking up this lunch so I wrapped the chicken sandwich in plastic wrap to keep it fresh. The plastic wrap can be removed and the sandwich heated in the microwave. Here is a reheating tip: Bread can become soggy when reheated in the microwave. 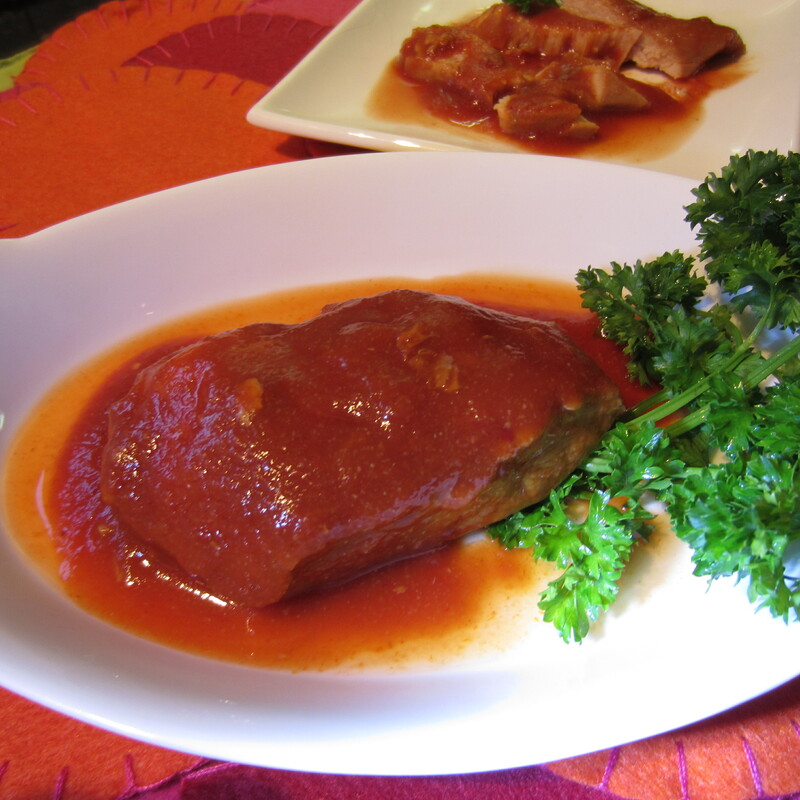 Remove the meat and microwave separately on a small plate. Then, place the two bun halves in the microwave for about 25 seconds. You just want them to be slightly warm. Reapply the heated BBQ chicken mixture to the bottom bun, slap on the bun top and you’re good to go! 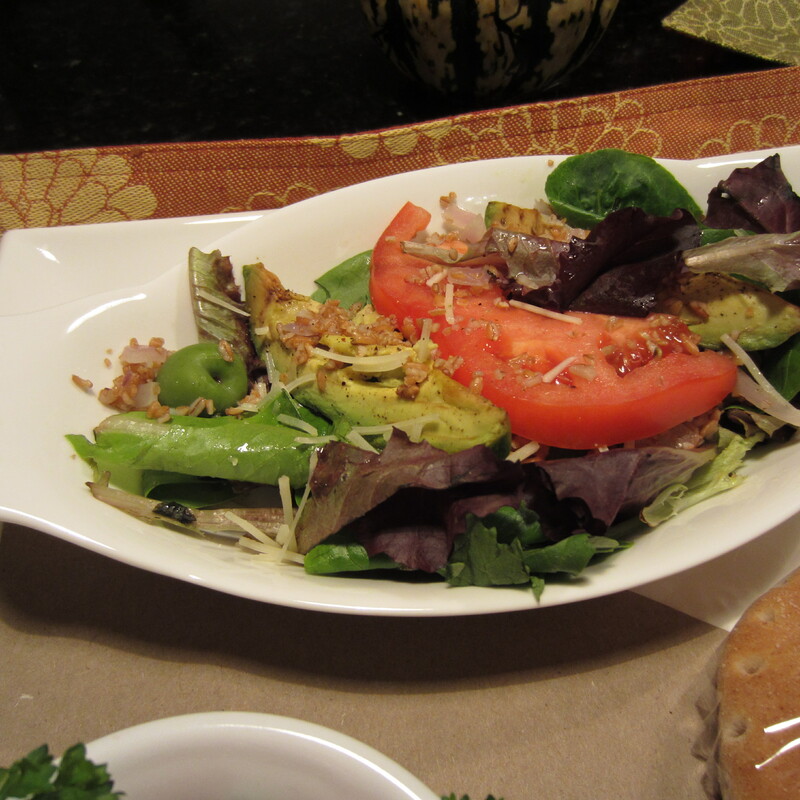 Let’s move on to the Roasted Avocado Salad. This was unexplored territory for me. Who has ever heard of roasting an avocado? Not me! The avocado was peeled and sliced into six sections. I sprayed a baking pan with non-stick oil (basil flavored) and roasted the slices in the oven for 15 minutes at a temperature of 400 degrees. Add plenty of salt and pepper to taste. I even sprayed extra basil flavored oil on the tops of the avocado slices. The final results received a thumbs up. The added bulgar wheat (or you can use couscous, which I didn’t have on hand) and diced red onion gave some bulk to the mix green salad. A simple lemon juice and olive oil dressing made the salad complete. 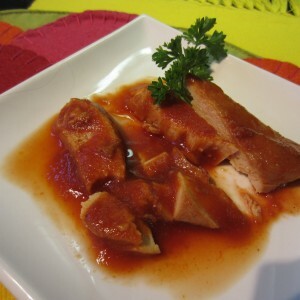 This is one of those meat dishes I wanted to pair with deep fried French fries. The chicken was tender and the sauce had plenty of tang. So what did Blimpy Girl add to this chicken dinner? Steamed broccoli and a mixed green salad. Trust me, I soooo wanted to go over the top with those French fries dipped in hot oil. However, I came to my senses and realized that a bowl of low-fat ice cream was a better choice. I can have my dinner and eat dessert too. Each 4 ounce chicken breast is just 150 calories. With a veggie and salad, you’re still looking at less than 200 calories. Throw in the low fat vanilla ice cream (with low fat chocolate syrup) for another 150 calories. Of course, you need to monitor your ice cream scoops. I’m basing it on 1/2 cup of ice cream. Geez, if I didn’t pace myself, I’d eat the whole frickin’ container of ice cream. I keep telling myself…. moderation, moderation, moderation. I had plenty of leftover apples from the orchard that were going to go bad if not used immediately. I knew my grandkids were coming for a weekend visit and cupcakes seemed a perfect fit. 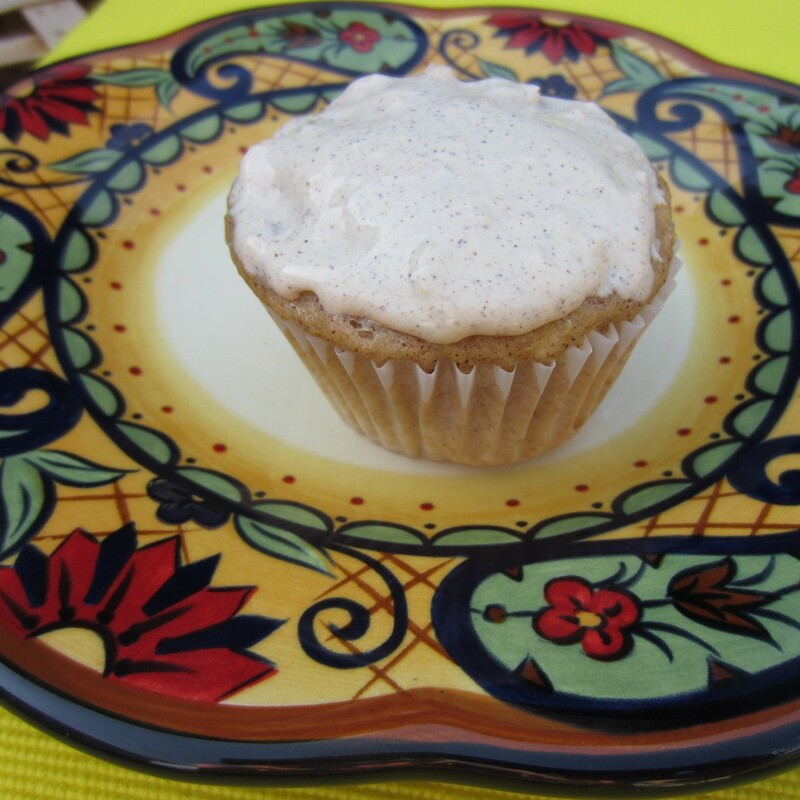 Warm spiced cider and freshly baked apple cupcakes on a sunny Autumn day. What more could you ask for? Hand print or use a computer program to print the guest names. It’s holiday time and Thanksgiving and Christmas will be here in a heartbeat. I do plenty of entertaining during the holidays and am always looking for new ideas to dress my table for dinner guests. 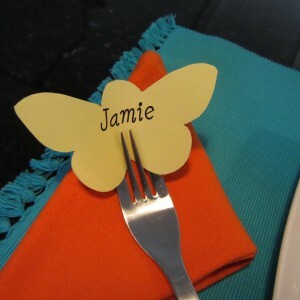 This is such a simple way to use place cards for table seating. I have included a PDF file for you to download these butterfly place cards. Just be sure to cut inside the black lines. I used a photo editing program to print the names on each placecard. You can also hand write the names. A gold or silver marker will lend itself to a holiday theme. Or, just use a black Sharpie marker. Hope you have better handwriting than mine. I used standard 20 lb. paper but card stock can also be used. Consider using other shapes such as a snowman, star or flower. Keep the design simple. There is plenty of free line drawing artwork online that will work well for printing table place cards. Part of the whole dining experience is visual. 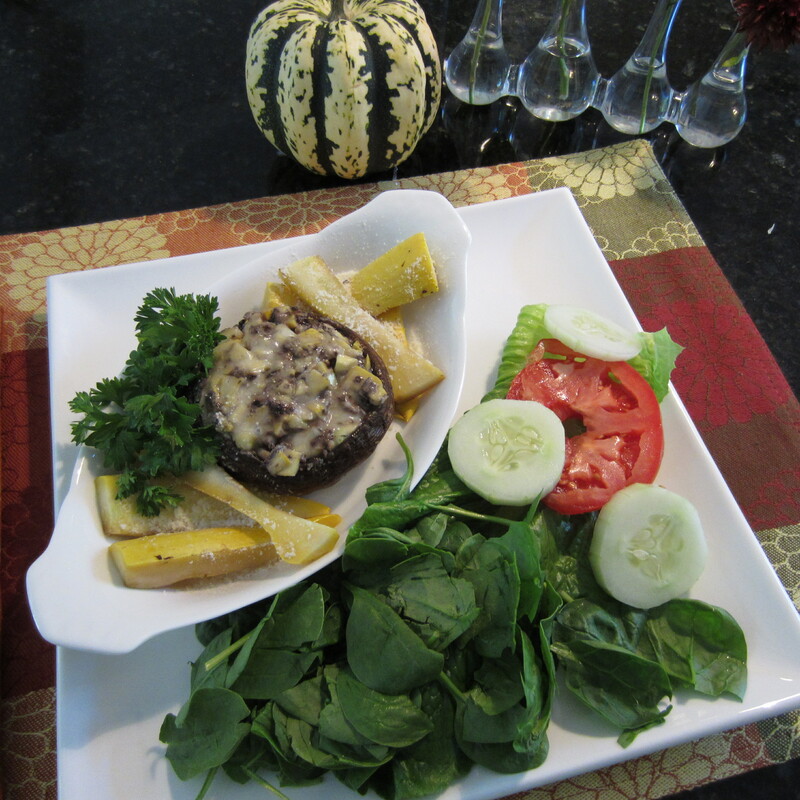 It’s about taste, but it’s also about how the eye perceives the presentation of the food. I am always scouting out inexpensive ways to make the food look over the top. 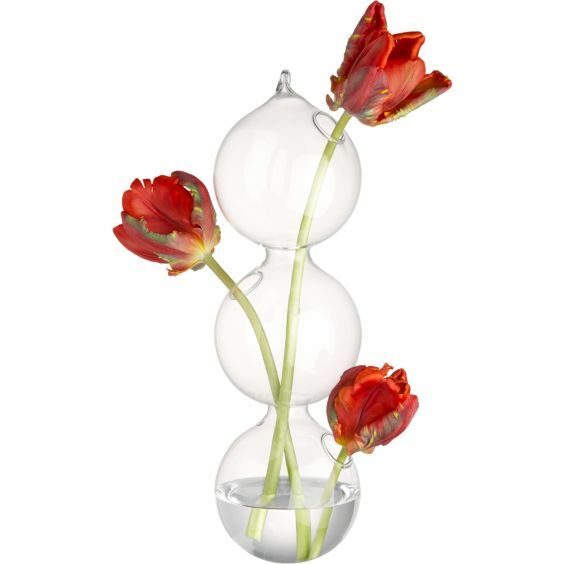 This above flower vase from CB2.com was a perfect fit for me. 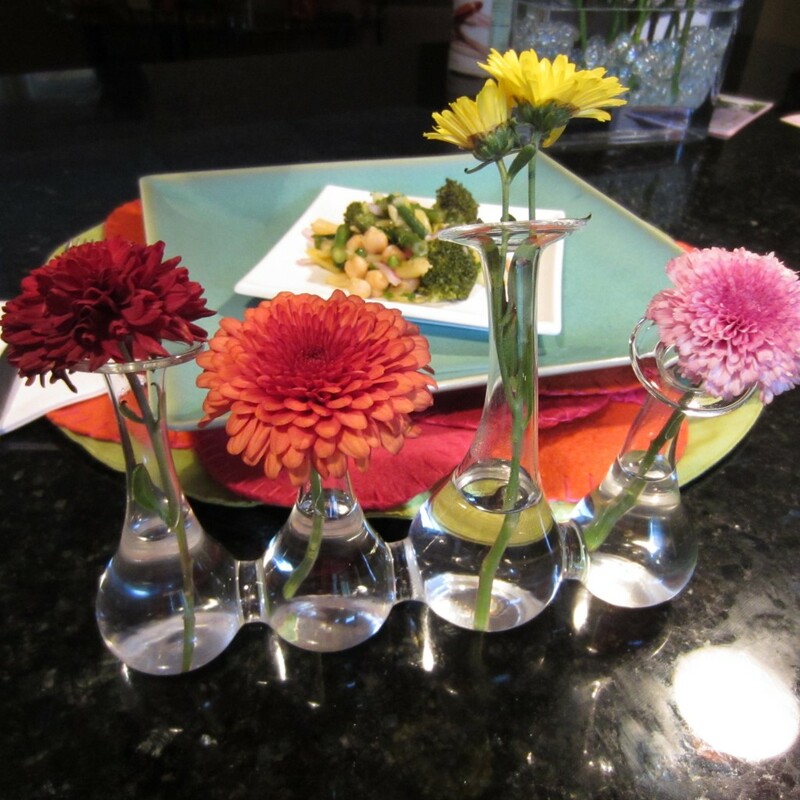 I have used these mini vases repeatedly not only for a table setting but also for arrangements on kitchen countertops and bathroom vanities. Pictured below are a couple of other favorites from CB2.com. All are very affordable (under $10) and can be used over and over again when entertaining. During the Thanksgiving and Christmas seasons, consider filling with holly sprigs or snippets of colorful mum flowers. Perfect size to place at each place setting. 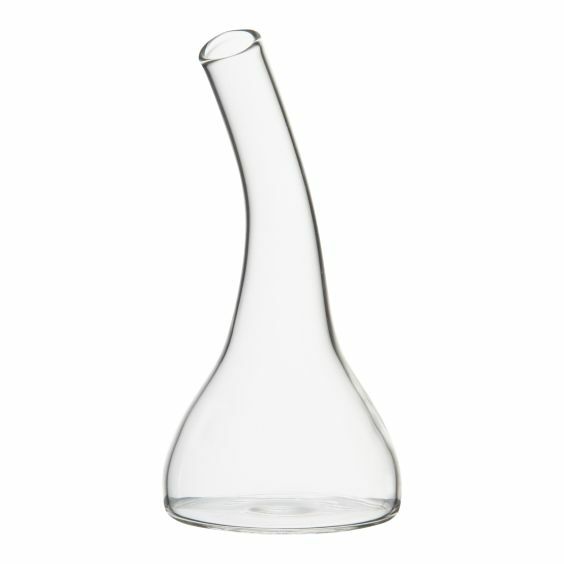 This vase hangs, but can easily sit on a table. 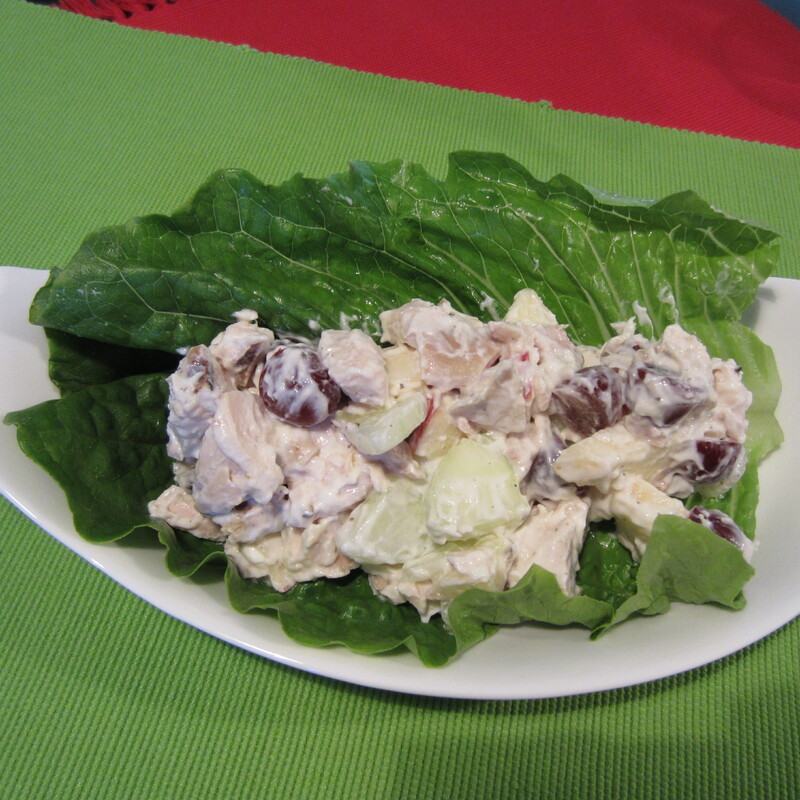 Grapes, cucumbers, chicken, apples, low-fat yogurt… what’s not to like about this dish. Scoop it onto a lettuce leaf and you’ve got yourself a low cal lunch that fits any Blimpy Girl meal plan.